#1 of "10 Places You've Got to See"
2014 Royal Tour of Canada - Why This Year? 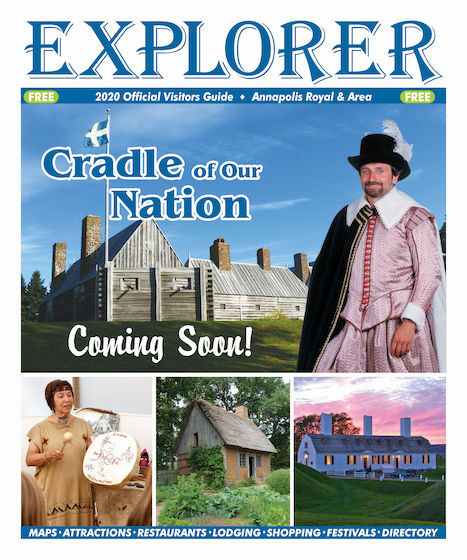 The EXPLORER has been covering the Annapolis Royal Area of Nova Scotia, CANADA since 1995. OUR 2019 EXPLORER VISITORS GUIDE IS NOW AVAILABLE! Click here or on the photo below. It showcases "What to See and Do" in the Cradle of Our Nation with Maps and information on Attractions, Tours, Restaurants, Lodging, Shopping, Festivals and an Area Business Directory. Our Spring/Summer Edition will be available soon. For updates, daily activities and special events be sure to follow and Like the Explorer Guide on Facebook. 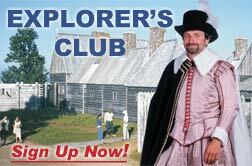 A series of five short MEET YOU IN ANNAPOLIS ROYAL VIDEOS, filmed by Rediscovering Canada Television and co-sponsored by The Explorer, are featured below. Until you can come in person, we invite you to enjoy a virtual visit through our videos and website. 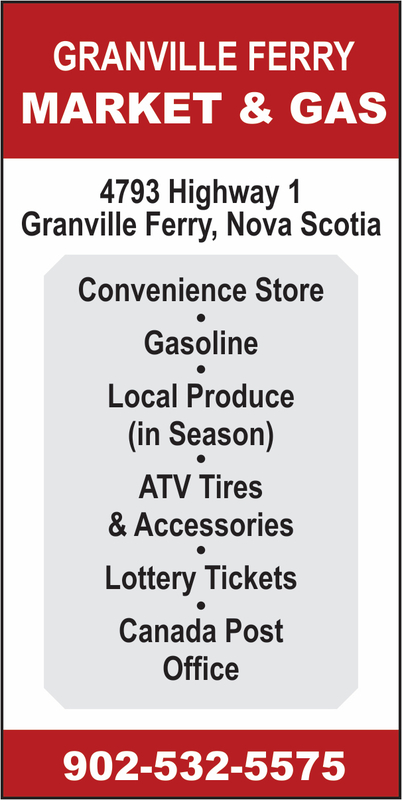 Explore historic, scenic and fun Annapolis Royal -- "The Cradle of Our Nation" and Nova Scotia first capital. The beautiful Annapolis Royal Area is also a POPULAR SPOT FOR WEDDINGS, ANNIVERSARIES & HONEYMOONS. Let the Explorer Guide and our Partners help you "Say I Do in Annapolis Royal" and make the most of your special day. After all, "Good Cheer" started here! You'll find a short sample WEDDING VIDEO just below the five Meet You in Annapolis Royal videos. Winner of “The World’s Most Liveable Small Community”, “Prince of Wales” and numerous “Communities in Bloom” awards, Annapolis Royal, Nova Scotia is often featured in magazines and commercials including Jeep and MacLean's Magazine as one of the "10 PLACES YOU'VE GOT TO SEE". Check out the colourful video below. 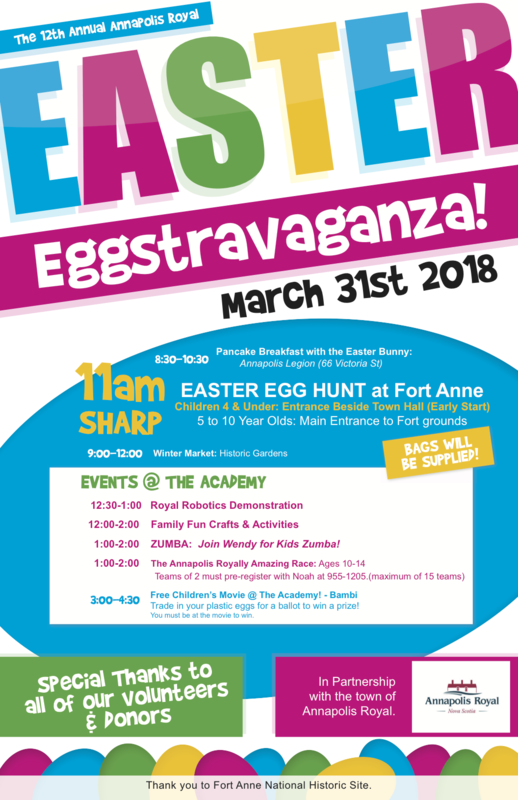 It's a great way to see some of the highlights of Annapolis Royal. LIKE & FOLLOW THE EXPLORER GUIDE ON FACEBOOK! 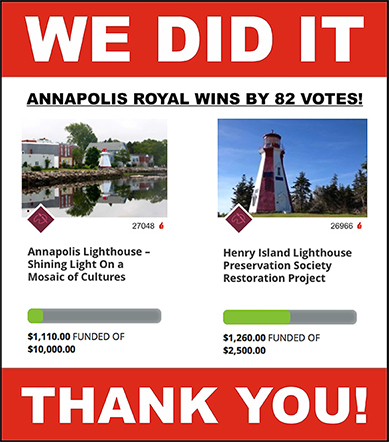 THANK YOU FOR HELPING US SAVE OUR ANNAPOLIS ROYAL LIGHTHOUSE! The Annapolis Royal Lighthouse was built in 1889 and needed significant structural work in order to preserve it. The Historical Association of Annapolis Royal entered it in the THIS LIGHTHOUSE MATTERS CONTEST in hopes of winning the funding needed to repair it. Due to the outstanding support our lighthouse received, we won First Place and $40,000 to preserve our treasured landmark. Out of the 26 lighthouses that entered, our Annapolis Royal Lighthouse garnered 27,048 votes -- the highest number and over 10% of all cast. THANK YOU! The The Annapolis Royal Historic Gardens was selected as a Canada 150 Garden Experience in 2017. It was also recognized by the Canadian Garden Council as Canada's 2015 Garden of the Year and was chosen as one of the Top 5 North American Gardens Worth Travelling For in 2013. This Old House Magazine selected Annapolis Royal in 2012 as one of the sixty-one most vibrant neighborhoods in North America for one-of-a-kind, period houses. That same year Annapolis Royal was the recipient of CBC Maritime's prestigious 2012 Cultureville Award in recognition of its vibrant arts community, culture and heritage. If you love design -- houses, garden, art, crafts, antiques, vintage and modern creations -- you will love Annapolis Royal! The area is more than Canada's birthplace...it is a centre for the design arts...a unique design destination. Originally called Te'wapskik by the Mi'kmaq, named Port Royal in 1604 by the French and renamed Annapolis Royal in 1710 by the British, it is one of the oldest permanent European settlements in the country -- and the most fought-over land in Canadian history. With a population of approximately 491 residents, Annapolis Royal is the smallest incorporated town in Nova Scotia, but with over 130 registered heritage properties, it is one of the largest National Historic Districts in Canada. 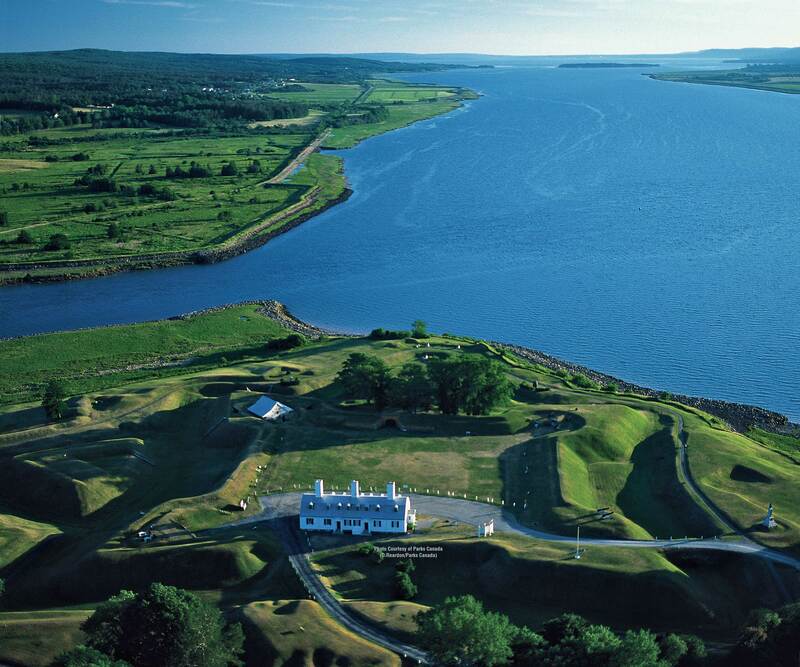 Nestled between two scenic rivers (with the world-famous Bay of Fundy only 10 minutes away), Historic, Scenic and Fun Annapolis Royal and its surrounding area make the perfect vacation destination. 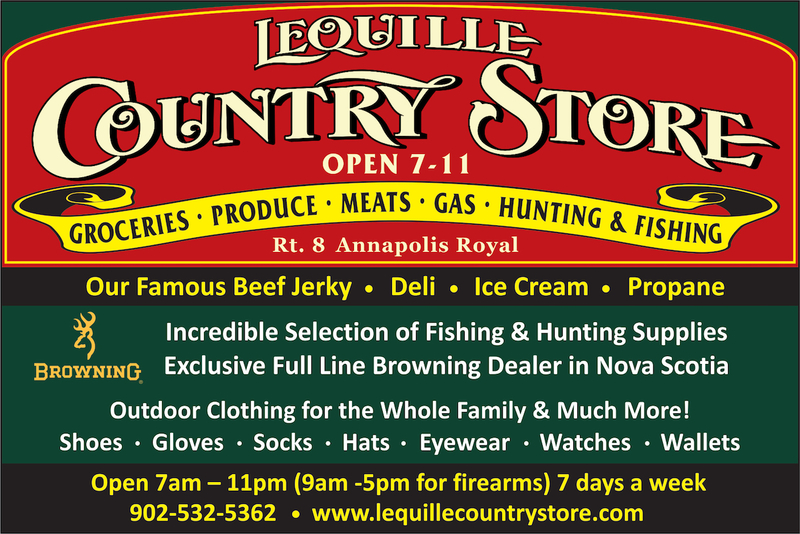 Winter, Spring, Summer and Fall ~ Annapolis Royal is delightful in all seasons. Whether you spend a day, vacation or a lifetime, Annapolis Royal, Nova Scotia is a great place to live life to the fullest. 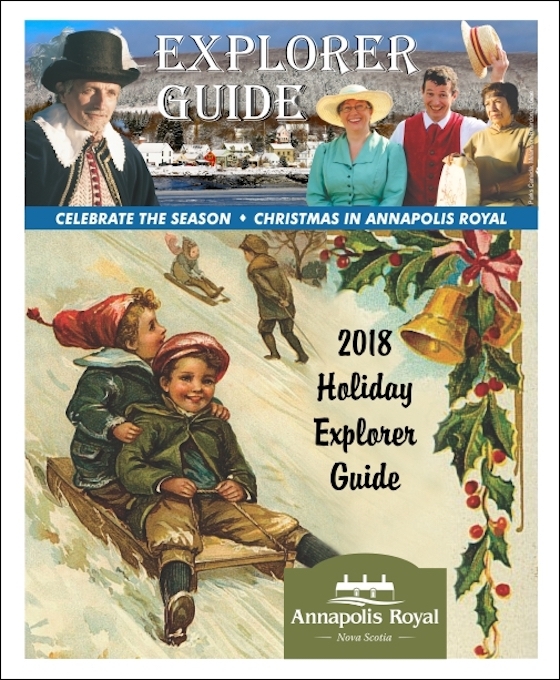 Our EXPLORER HOLIDAY MAGAZINE showcases the highlights of enjoying an old-fashioned Christmas in the Annapolis Royal Area. For our 2017 edition, click on the photo below. Many of the same events are planned for 2018. Here's how to be a Partner in Progress with Us for the 2019 Explorer! © Copyright 2018 Explorer Communications. All Rights Reserved.